No old coots at Hopland! The UC Hopland & Extension Center is blessed with a large array of flora and fauna. With nearly 200 species of birds that have been documented on the Center, the Bald Eagle (Haliaeetus leucocephalus) is one of the most prominent bird species seen. 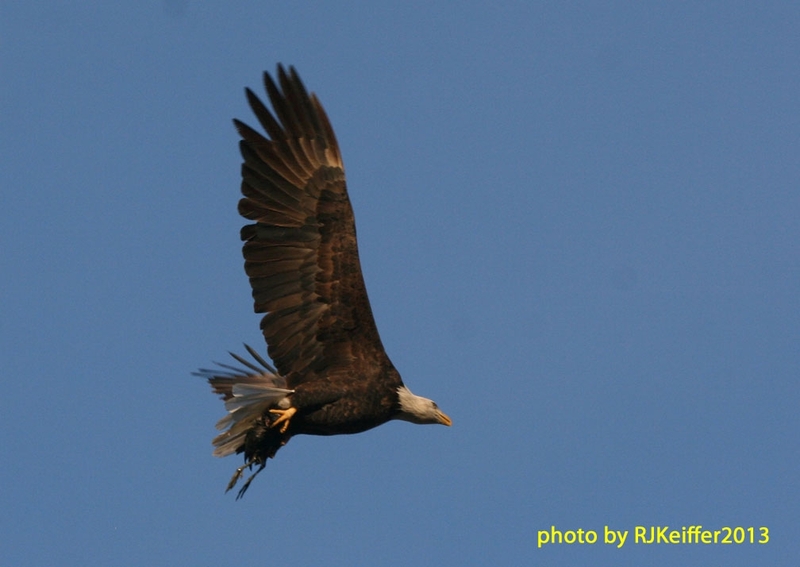 There may be a handful of breeding Bald Eagles in Mendocino County, but only one nest site thus far has been documented with successful breeding (near the Eel River). This large bird of prey is most likely to be found along bodies of water (like Lake Mendocino), or rivers and streams (like the Russian and Eel Rivers), or along coastlines (like near Albion and Anchor Bay), or farm ponds (like this one along University Road, Hopland). Mendocino County gets a few more bald eagles in the winter as the "winter visitors" arrive from the north. This mature Bald Eagle that I photographed this morning at HREC was carrying an American Coot from a nearby farm pond. So ... you may have a difficult time finding old coots at HREC!